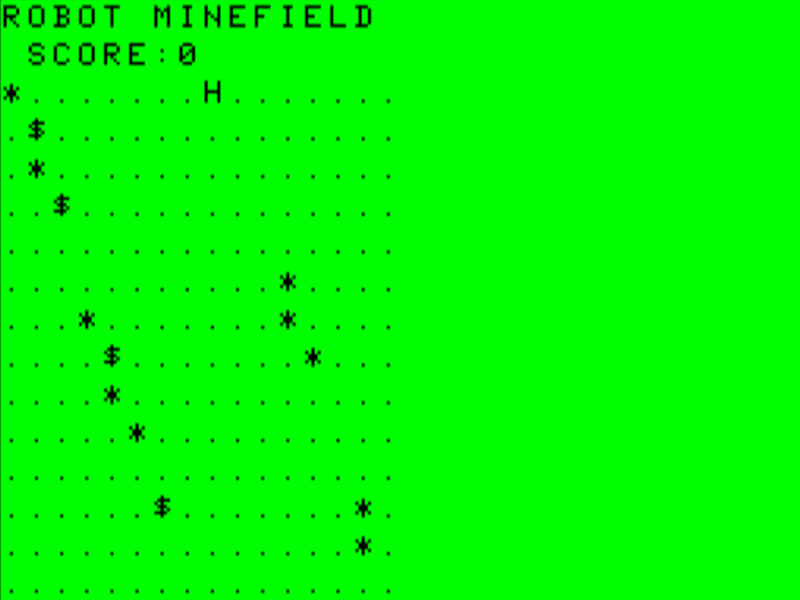 Robot Minefield is a BASIC game I typed in from Tim Hartnell's Giant Book Of Computer Games book. Neat game, and a simple enough game I'm using it as an exercise to write it in assembly. The game is a little like Rogue in that the computer doesn't move until you do. 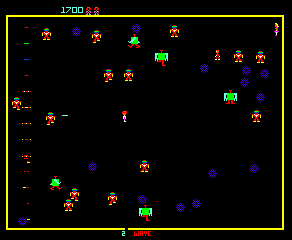 But what's most interesting about this game, is that it is a remake of a game called Robots and mines on the Commodore PET, and was one of the games that inspired the arcade shooter Robotron 2084. You can find the BASIC and C versions, or the Assebmly version on github. In fact, one of the first enemies that Eugene Jarvis made were the Electrodes, which are lethal stationary objects. Much like the mines in Robots and Mines, and here in Robot Minefield. Check out his classic postmortem on youtube. So after typing in the BASIC version, I made a couple tweaks so it updates the screen after the human and robots move. I also made it so it draws the minefield over itself rather then clearing the screen. I didn't think of doing an assembly version until I played it for a bit. BASIC is ungodly slow, and I felt the game was nifty and wondered how it would play if it was faster. CLICK The light went on in my head and the idea of the assembly version was born.